Turn your day-to-day tasks into an experience in elegance with the Glyde collection from MOEN. Stylishly simple, Glyde's graceful curves and transitional contours flow as beautifully as the water stream. Two gently arcing lever handles make it easy to adjust water temperature and flow while beautifully framing the faucet. Smoothly finished in LifeShine brushed nickel that's guaranteed to last, this eco-friendly design is also WaterSense certified to ensure efficient water usage while maintaining the performance you expect. This new piece from Delta brings fresh water fast and adds a stylish look to any bathroom. This dual-control faucet adds a classy look to any bathroom project. Make your sink look even more beautiful with this item's easy-to-install deck mounted design. Save water and get the same clean with this WaterSense certified faucet. With its bold, angular profile and subtle curves, the GROHE Tallinn 1-Handle 4 inch Centerset in Brushed Nickel InfinityFinishcommands attention in any bathroom setting. European designed and German engineered, the contemporary-style single-lever mixer incorporates a GROHE SilkMove cartridge for smooth, one-finger control of the water volume and temperature and GROHE Ecojoy technology, which saves water without sacrificing performance. Minimalism takes on a softness in the elegant GROHE Veletto 2-Handle 4 inch Centerset in Brushed Nickel, making it ideal for contemporary and even transitional-style bathrooms. Two lever handles, each tipped upward for ergonomic comfort and equipped with GROHE SilkMove cartridges, provide smooth, yet precise control of the water volume and temperature, while GROHE EcoJoy technology saves water without sacrificing performance. The GROHE Veletto 1-Handle 4 inch Centerset in Brushed Nickel makes a statement with its elegant gooseneck spout and soft minimalist attitude. Exemplifying both contemporary European design and German engineering, the faucet operates via a side lever handle equipped with a GROHE SilkMove cartridge for smooth, precise control of the water volume and temperature. The swivel spout provides added convenience. GROHE Ecojoy technology saves water while ensuring optimal flow performance. Glyde 4-Inch Centerset 2-Handle High-Arc Bathroom Faucet In Brushed Nickel Turn your day-to-day tasks into an experience in elegance with the Glyde collection from MOEN. Stylishly simple, Glyde's graceful curves and transitional contours flow as beautifully as the water stream. Two gently arcing lever handles make it easy to adjust water temperature and flow while beautifully framing the faucet. Smoothly finished in LifeShine brushed nickel that's guaranteed to last, this eco-friendly design is also WaterSense certified to ensure efficient water usage while maintaining the performance you expect. 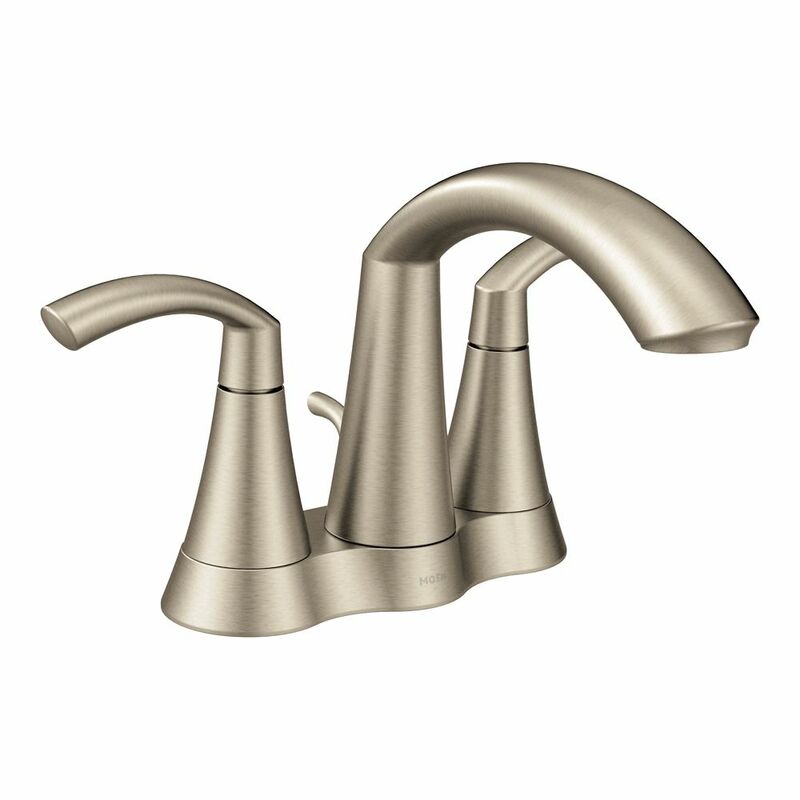 Glyde 4-Inch Centerset 2-Handle High-Arc Bathroom Faucet In Brushed Nickel is rated 5.0 out of 5 by 1.